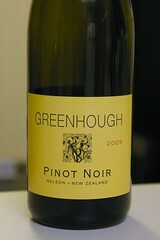 Greenhough (green-hoff) is a family owned vineyard and winery established in 1991. Located at Hope, near Nelson at the top of the South Island, our vines are planted in free-draining, clay-rich soils beneath the foothills of the Richmond Ranges. Eight clones of Pinot Noir were individually hand-harvested, batch fermented and aged in French oak for 12 months prior to blending. The extremely low yielding 2005 vintage has produced a well structured wine with a concentration of cherry, brambly aromas and flavours, hints of chocolate, spice and savoury complexity.